About five years ago there was a major rainstorm in early May that dropped 12 inches on our Platte River Prairies within 24 hours, and flooded most of our sites for several days. I wasn’t too worried about most of the prairies (they’re floodplain prairies, after all, and should be used to flooding) but I was concerned about the influx of purple loosestrife from the out-of-bank river and about the fate of a few young prairie restoration seedings. A the same time, I was hoping the big rain would help end the drought we’d been in for more than five years (it didn’t). As the prairies dried out, I started checking them to see how things looked. I was walking through a 5-year –old prairie seeding looking at the prairie plants, which were looking very good, when I suddenly noticed the ant hills. Everywhere I looked, there were ant hills. I couldn’t take a step without trampling one. I had a quick illogical thought that we’d been invaded by fire ants. Once my brain kicked back into gear, I realized that I was likely seeing the simultaneous rebuilding/repair of all the ant tunnels that had been in place prior to the big rain. 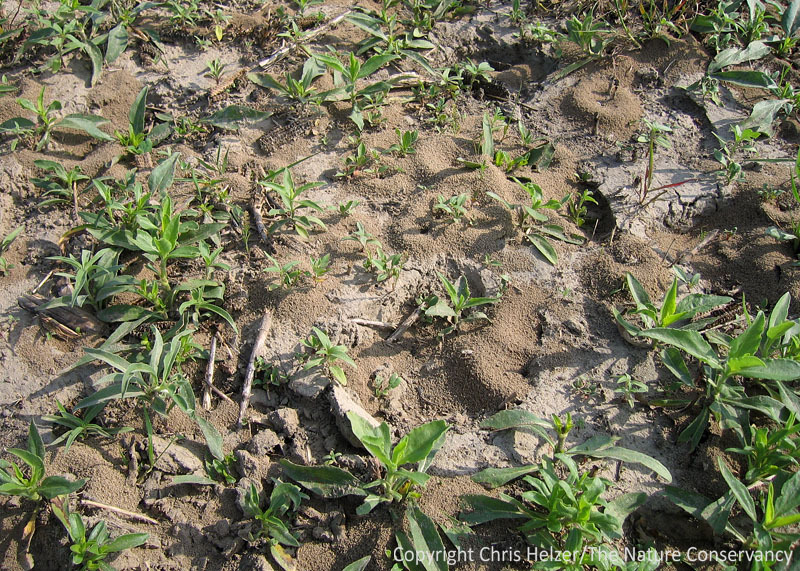 Ant hills in a 5-year-old prairie seeding about 2 weeks after flooding. Ants are extremely important to prairies as predators and earth movers (and fill other roles as well) and I knew that they were really abundant, but until I saw the density of hills after that flood I didn’t really have a good idea HOW abundant they could be. After all, the hills are the tip of the iceberg, and only indicate the presence of numerous and extensive tunnels beneath the surface. Before writing this post, I contacted James Trager (Missouri Botanical Garden) to see what he could tell me about the phenomenon I’d observed. James said he thought most the hills were probably made by Lasius neoniger, the “cornfield ant”, which is a very abundant species common to prairies with sandy soil. He also said ants can survive floods by finding refuge in air pockets within their underground nests. That’s something I hadn’t thought about either – all the invertebrates living belowground have to be able to survive saturated soils, especially in floodplain prairies. I thought about using these photos and story as the basis for a larger post on prairie ants, but decided that it would be redundant. James has already written an excellent and succinct synthesis of the fascinating world of prairie ants. Rather than trying to steal his ideas and re-write them, I’ll simply give you the link to his. If you haven’t read his introduction to prairie ants, it’s well worth the few minutes it’ll take you to read it. A wider view of the same site. 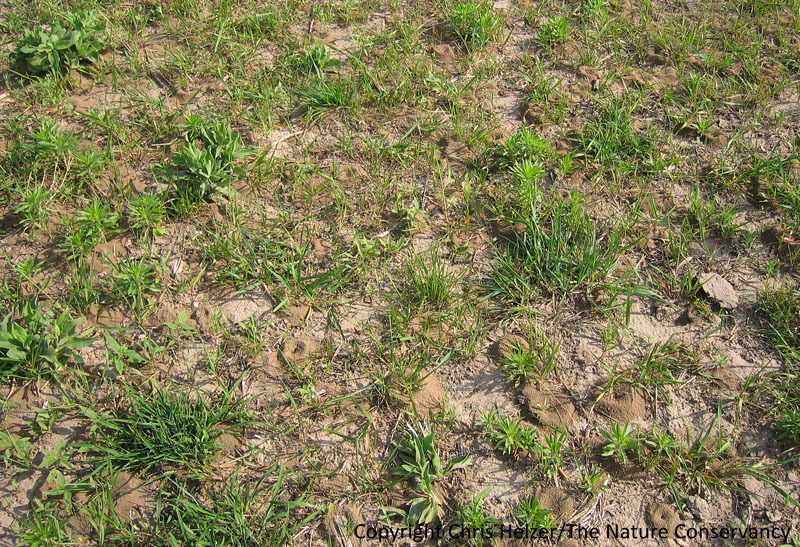 This density of ant hills appeared to exist across the entire 80 acre prairie. It’s an amazing world, isn’t it? This entry was posted in Prairie Insects, Prairie Natural History, Prairie Photography, Prairie Restoration/Reconstruction, Uncategorized and tagged ants, flood, insects, natural history, photography, platte river, prairie, prairie reconstruction, prairie restoration by Chris Helzer. Bookmark the permalink. I grew up in the South where “fire” ants were a major problem. Seeing a field full of mounds is not an unusual sight and definitely something to avoid. Are these found in the southern prairies and are they moving northward to Nebraska? They definitely take the fun out of strolling through a grassy field! I’ll jump in here to reassure all that there are no fire ants anywhere within hundreds of miles of Chris’s prairie sites in Nebraska. (The closest fire ants are in far southern Oklahoma.) In the Southeast, fire ants do occur in blackland prairie and less often in sandy prairie sites . However even there, in an intact prairie, if not disturbed by all but the lightest grazing or flooding, the fire ants never build up in numbers sufficient to displace native ants, nor to be more than a minor nuisance. The cornfield ants of more northern prairies, which also occur in agricultural landscapes, are considered pests by farmers. This is somewhat justified because of their habit of cultivating sap-feeding aphids (and planthoppers) both above and belowground, from which the ants gather a sugary waste product of the aphids’ sap diet called honeydew, which in turn serves as a major carbohydrate source for these little predators. In upland planted prairies, cornfield ants consititute a pioneer or nurse species, typically decreasing in numbers and giving way to a more diverse ant fauna as the prairie matures. Thanks for taking that one James. I’ll not try to add a thing. Fascinating, did you have an opportunity to macro-photograph any of the ants? Mark – Unfortunately, no. I had only my pocket camera with me at the time. I’ve got other macro shots of ants, but none from these particular hills. Would be nice, because than I could have James ID them for sure.